You don’t have to spend too much money to get a pre-owned car that will last. At Stingray Chevrolet, you’ll find the used car for sale under 10000 that you’re looking for near Lakeland, as well as a variety of other used car specials. Each of our used vehicles has been inspected by one of our certified technicians so you can be sure you’re making a sound investment. Stop in today to check out all our affordable used sedans, trucks, SUVs, and more at our dealership in Plant City, or contact us at (813) 359-5000 with any questions! KBB.com 10 Best Used Family Cars Under $15,000. Only 65,304 Miles! Delivers 23 Highway MPG and 17 City MPG! This Toyota Sienna delivers a Gas V6 3.5L/211 engine powering this Automatic transmission. Washer-linked variable intermittent wipers, Vehicle stability control (VSC) w/traction control, Variable-assist pwr rack & pinion steering. *This Toyota Sienna Comes Equipped with These Options *Upper & lower glove boxes, Torsion beam rear suspension, Tire Pressure Monitor System, Tilt/telescoping steering wheel, T155/8017 compact spare tire, Remote keyless entry, Pwr soft-touch rear door release, Pwr front & side windows w/jam protection, Pwr 4-wheel disc brakes, P215/65R16 all-season BSW tires. * This Toyota Sienna is a Superstar! *KBB.com Best Resale Value Awards, KBB.com 10 Best New Road Trip Vehicles, KBB.com 10 Best Used Family Cars Under $15,000. * See What the Experts Say! *As reported by KBB.com: If you're comparing minivan comfort and convenience, you'll find the 2010 Toyota Sienna borrows many of the best ideas from each of its competitors and combines them into a strong, well-built platform. The Sienna is the only minivan to offer the option of all-wheel drive. * Stop By Today *You've earned this- stop by Stingray Chevrolet located at 2002 N Frontage Rd, Plant City, FL 33563 to make this car yours today! NACTOY 2007 North American Truck of the Year. Only 122,140 Miles! Delivers 19 Highway MPG and 15 City MPG! This Chevrolet Silverado 1500 Classic delivers a Gas V8 4.8L/293 engine powering this Automatic transmission. WHEELS, 4-17 X 7.5 (43.2 CM X 19.1 CM) 6-LUG CHROME-STYLED STEEL, includes chrome center caps and steel spare (STD), TRANSMISSION, 4-SPEED AUTOMATIC, ELECTRONICALLY CONTROLLED WITH OVERDRIVE AND TOW/HAUL MODE (STD), TRAILERING EQUIPMENT, HEAVY-DUTY, includes trailering hitch platform, 7-wire harness (harness includes wires for: park lamps, backup lamps, right turn, left turn, electric brake lead, battery and ground) with independent fused trailering circuits mated to a 7-way sealed connector, instrument panel jumper wiring harness for electric trailer brake controller, and 1-way sealed connector for center high-mounted stop/brake lamp, (K47) high-capacity air cleaner and (KNP) external transmission oil cooler. *This Chevrolet Silverado 1500 Classic Comes Equipped with These Options *SKID PLATE PACKAGE, includes aluminum front underbody shield starting behind front bumper and running to first cross-member, protecting front underbody, oil pan, differential case and transfer case, frame-mounted shields, AIR CLEANER, HIGH-CAPACITY (Included with (Z82) heavy-duty trailering equipment or (VYU) Snow Plow Prep Package.) , TIRES, P265/70R17 ON-/OFF-ROAD, BLACKWALL, includes an on-/off-road blackwall spare (STD), SEATS, FRONT 40/20/40 SPLIT-BENCH, 3-PASSENGER, DRIVER AND FRONT PASSENGER MANUAL RECLINING, center fold-down armrest with storage, adjustable outboard head restraints and storage pockets on Extended and Crew Cab models (STD), SEAT TRIM, CUSTOM CLOTH (STD), REAR AXLE, 3.73 RATIO (STD), PAINT, SOLID (STD), LS PREFERRED EQUIPMENT GROUP Includes Standard Equipment, GLASS, SOLAR-RAY DEEP TINTED (all windows except light-tinted glass on windshield and driver-and front passenger-side glass) (With Extended Cab models, includes rear window and rear quarter windows. With Crew Cab models or (C49) rear-window defogger, includes light-tinted rear window), ENGINE, VORTEC 4.8L V8 SFI (285 hp [212.3 kW] @ 5200 rpm, 295 lb-ft of torque [398.2 N-m] @ 4000 rpm) (STD). * The Experts' Verdict...*As reported by KBB.com: If you need a serious work truck that can haul loads of dirt or tow a horse trailer, there is a Silverado Classic with your name on it. The Silverado Classic's interior can be quite plush, but the price starts to climb when it's so equipped. * Visit Us Today *Test drive this must-see, must-drive, must-own beauty today at Stingray Chevrolet, 2002 N Frontage Rd, Plant City, FL 33563. Take Home an Affordable Used Car Near Valrico Today! 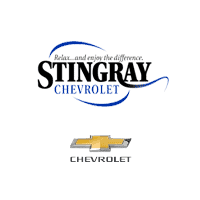 In addition to our impressive selection of affordable new and used cars, the team at Stingray Chevrolet is dedicated to bringing you a second-to-none customer service experience at our dealership in Plant City. Count on us for all your Chevy service , Chevy parts, and transparent auto sales near Brandon, and come see us during our regular sales hours, Monday through Saturday!